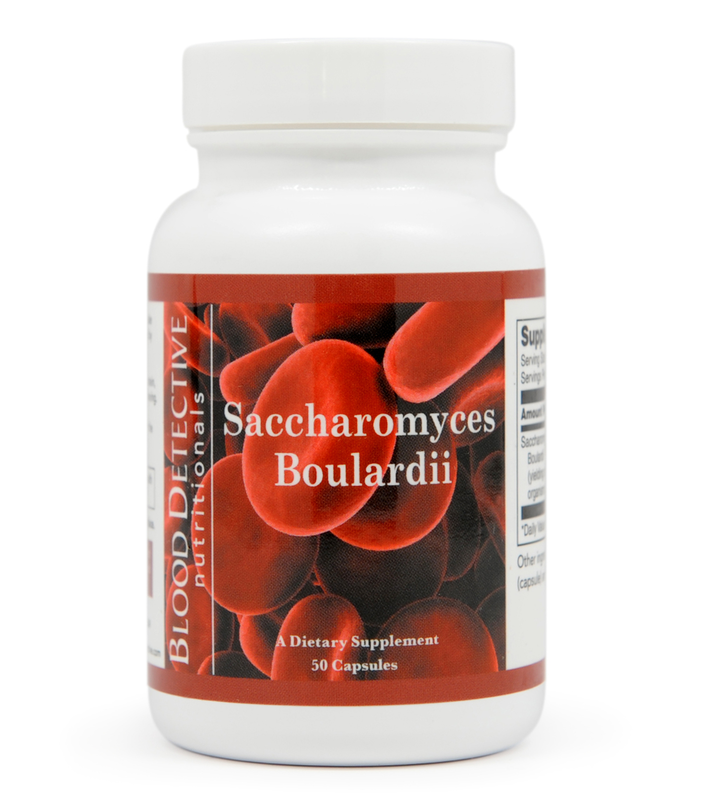 Saccharomyces Boulardii provided by Blood DetectiveTM Nutritionals, supplies 300 mg of Saccharomyces boulardii, which yields over 3 billion organisms per capsule. Saccharomyces Boulardii provided by Blood DetectiveTM Nutritionals, supplies 300mg of Saccharomyces boulardii, which yields over 3 billion organisms per capsule. If harmful organisms proliferate, the equilibrium is disturbed, and it becomes difficult even for indigenous bacteria to maintain their necessary territory to colonize the intestine. Antibiotics tend to kill off both benefi cial and harmful bacteria, and thus may disturb the normal, healthy balance of intestinal microorganisms. Saccharomyces boulardii is a nonpathogenic yeast that can support the gastrointestinal tract. Research studies have indicated that S. boulardii may work by modulating the body’s immune response, thus helping to improve the resistance to enteropathogenic bacteria. Saccharomyces boulardii has been studied extensively to reduce morbidity and mortality in patients with claustridium diffi cile infection; responsible for at least 100,000 hospitalized who acquire this infection annually in the United States. C. Diff. infection results from the proper and incorrect use of certain antibiotics especially metronidozide. Suspect C. Diff. infection in persons with unremitting diarrhea. Saccharomyces Boulardii may be a useful dietary adjunct for individuals wishing to support their intestinal microfl ora with meaningful amounts of Saccharomyces boulardii. Adults take 1 capsule with each meal or as directed by physician.